These relocating tips will ease your concerns about moving your breakables. Using the right kind of box when relocating for packing china, glassware and breakables can ensure a safe move of this precious cargo. Yes, any kind of box will do when that's all you have—just use more packing material for thinner boxes. If you can get them, boxes built for moving china and dishes are the best for breakables. Dish barrels are ideal. They are made of stronger and thicker cardboard to absorb travel shock and protect your dishes. Although the name comes from wooden barrels which were used to ship china overseas, moving companies carry a supply of the cardboard alternatives. They cost a little more than regular moving boxes but are worth it. Ensure you set up the boxes properly and tape the bottoms correctly. Use only strong, wide packing tape and not masking or duct tape. A tape gun or applicator will make this job easier and with a little practice, you'll find them easy to set up. Draw tape across the bottom and up the sides about one-third of the way. The additional tape is needed to secure ends and keep the container square while taping. You can use newsprint for packing breakables, but each piece will require washing when you unpack. White packing paper is preferred and can be purchased by bundle from a mover. Set up a stack of paper on a table and with your carton handy, you're ready to start packing. Get the whole family involved. 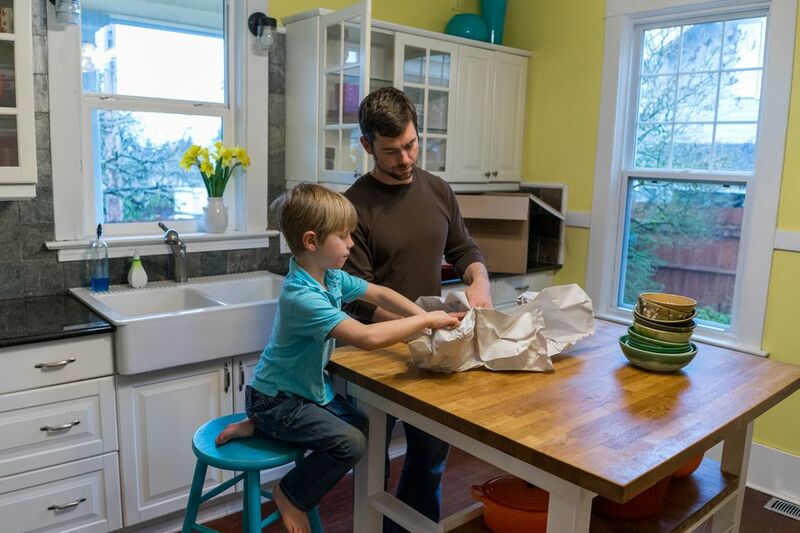 Children as young as 7 years old can help with packing even breakable items if trained properly. This sets the stage for the adventure of moving and makes them feel helpful and needed. The first thing to go into your packing carton is a soft bed of packing paper to cushion box contents during travel. Crumpled paper is the best, not folded newsprint or paper. The crumpling provides more shock absorbing benefits for the move. Don't be shy when it comes to using the paper—you need about a 6-inch bed of paper on the bottom of each box. Always start packing your carton with the heaviest, sturdiest glassware and ending with most fragile in the top half of the box. For example, glass serving trays or heavy glass mugs may make up the bottom layers. The key to properly wrapping is to have lots of packing material on both the bottom and top of the box and each piece wrapped individually for the best protection. Lay your piece of glassware on the stack of wrapping paper. Using one sheet of paper, insert some paper into the open end of the dish. This will provide more cushioning. Fold or tuck both sides of the paper up and over it. Roll and tuck sides in as you roll each piece. Always wrap each dish separately. For crystal or very thin glassware, you can double wrap by repeating this procedure. Continue to wrap glassware and breakables in packing paper using the same illustrated method. This ensures each part of the glass has ample layers of paper for best protection. Double wrapping crystal or fine glassware or stemware by repeating this step with another sheet of paper provides further protection. The object is not to make neat bundles, but to ensure adequate layers of paper protects your dishes. The more crumpling of paper—the more layers and better protection. Use the same wrapping style for glasses or stemware. Place your wrapped bundles as you finish each one, on the crumpled bed in the dish barrel or carton. Line items side by side and add more packing paper as required in corners and sides of the carton where impact risk is greater. Add another sheet or two of packing paper in between layers and fit small glassware items where space allows. If you can hear a 'clunking' noise or items making contact as you place them in the box, there isn't enough packing paper to prevent breakage. Adjust as required and don't be afraid of using too much paper. Follow the same wrapping for plates, placing paper between each item and then you can place them in small stacks of same-size plates in your packing carton, adding more paper as needed to wrap each stack. Always pack larger and heavier plates first in the bottom of the box. For durable break-resistant dishes such as Corelle plates, you can wrap with less paper between each but allow at least two layers of paper. Wrinkled or overlapped paper provides more cushioning. When packing more fragile porcelain, stoneware, or china, do not be shy with paper. You want to avoid having to look for a replacement piece if it should get broken in transit. Be generous with paper. Add your wrapped bundles to the carton until you are about 3 inches from the top. You will need to add a crumpled layer of paper on the top and this is also a good place to add items such as small non-breakables, lightweight wooden or durable plastic trays. Fill the top of your carton with paper so that when you tape down the top flaps, you cannot depress or push down on the top of the packing box. When loaded into a moving truck, boxes are usually stacked several boxes high— if your carton is not firmly packed, the resulting compression can damage your contents. Remember to always mark your boxes to make unloading into the proper area or room easier for the movers. If you anticipate another move in the not-so-distant future, you can flatten your dish barrels or packing boxes for recycling, plus lay out and straighten all the packing paper. Bundle it and store packing materials in a dry place. Reusing packing materials can help to reduce your moving costs if you expect to be relocating again soon, so the extra work is certainly worth it.